Passion flower (Passiflora) is a genus that contains about 500 species of plants, mostly vines native to tropical areas. The flowers may be blue, purple, red or magenta. Passion vines produce an edible fruit (passion fruit) that is about the size of a hen's egg and may be purple or yellow. Passion flowers grow well in disturbed areas such as roadsides, old fields and along fences. They can be weedy and invasive in some areas. Passion flower is a very aggressive climbing vine that grows up to three inches a day, which probably evolved in the highly competitive environment of a tropical rain forest where it would have had to climb over many tall plants for access to sunlight. Passion flower vines will quickly climb up the walls of your home if given the opportunity. Passion flowers are native to the tropical and subtropical areas of the Americas, but many species are grown outside of their natural range for the edible fruit and beautiful flowers. Passion fruits are cultivated mainly in the Caribbean and in Florida. Within the U.S., passion flowers are present in the Southeastern part of the country. They can be found as far north as Pennsylvania and as far west as Texas, and they are especially easy to grow in the southern part of this range. The name "passion" does not refer to romantic love, but to the passion of Christ. Spanish missionaries in the fifteenth and sixteenth centuries adopted the flower as a symbol of the Crucifixion. The flower is said to resemble the crown of thorns worn by Jesus. The three stamens represent Christ's wounds and the twelve petals represent the apostles. Passion flowers require full sun and prefer slightly acidic, well-drained soil. Provide a trellis or something else the vines can climb. You can start with seeds or cuttings. Cuttings are your best bet, because the seeds do not keep well and are unlikely to germinate if they are stored for any length of time, and vines grown starting from seed can take many years to produce their first flower. Passion flowers are easy plants to grow overall, but they cannot withstand cold temperatures. 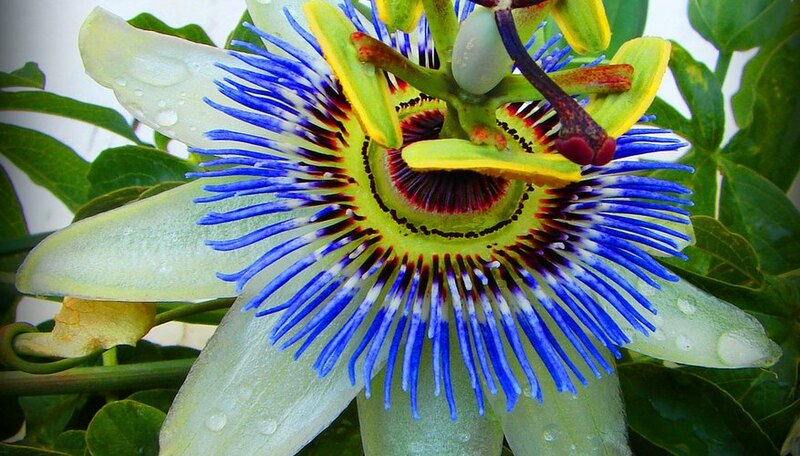 Passion flowers are frequently grown solely for the amazing flowers, but they are also cultivated for their fruits (passion fruit), and for the plant's medicinal properties. The passion flower plant contains psychoactive compounds thought to have a calming effect, and it has long been used to treat insomnia and anxiety. According to the University of Maryland Medical Center, one study showed that passion flower given to people with generalized anxiety disorder was as effective as the drug oxazepam. Passion flowers are also recommended for attracting butterflies to your garden.